A request for accommodation of alleged employee anxiety triggered by clapping should be treated in the same way as any other disability-related request for accommodation. Manchester may be best known for its premiership football teams and spawning the likes of Oasis and The Smiths, however, the City was in the headlines last month for something quite different: its Student Union (“MUSU”) voted to replace clapping at all of its events with “jazz hands” (i.e. the practice of waving open hands in the air). The ban, which also seeks to limit ‘whooping’ and ‘cheering’, comes in response to MUSU’s concern that traditional clapping may cause issues for students with anxiety and/or sensory issues, and as such would allow the organization to be more inclusive. MUSU’s decision to replace clapping with “jazz hands” has received a mixed response – with some championing its inclusivity while others have referred to it as political correctness gone mad. “Jazz hands” does not possess a global uniform meaning. While many in Canada may appreciate the intent behind the proposal (i.e. a silent show of approval), some may construe this physical gesture as offensive or insulting. For example, it could potentially be misinterpreted as a “mountza” – a traditional gesture of insult in Greece. The adoption of “jazz hands” policies raises an interesting issue for Ontario workplaces. While, as far as we are aware, no organization in our province has yet to limit clapping in the workplace, given the statutory requirement for all employers to provide reasonable accommodation of employee disability, such a move could be foreseeable. That said, a request for accommodation of alleged employee anxiety triggered by clapping should be treated in the same way as any other disability-related request for accommodation (i.e. establish that there is in fact a disability triggering a duty to accommodate, and engage in a meaningful way to provide reasonable accommodation of the disability in question up to the point of undue hardship). 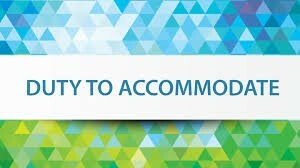 The situation becomes more challenging for employers when the reasonable accommodation of one employee would simultaneously discriminate against others (see the relevant Ontario Human Rights Commission Policy here). For example, and analogous to the above “jazz hands” scenario, an employee requires a service dog to perform her job, however, one colleague has a phobia of dogs, while another is highly allergic to dog hair and dander. In this case, the employer would want to ensure that they have an accurate understanding of the employees’ accommodation needs to determine whether a true conflict exists (and whether there is another way for the employee to perform her job without a service animal and still be reasonably accommodated). If a true conflict does exist, however, the employer will then want to explore whether there are other reasonable ways that it may accommodate the needs of the three employees while having them continue to perform productive work on its behalf. This process may be challenging and could require the input of other parties (such as a related union and/or medical professionals) to either find a workable resolution, or perhaps demonstrate undue hardship. Vey Willetts LLP is an Ottawa-based workplace law firm, serving individuals and employers across Eastern Ontario. They recognize that operating a business is complex and maintaining an efficient and legally-compliant workplace is a continuous challenge. The firm helps simplify legal workplace obligations so that employers can focus on what matters: their business. Learn more about Vey Willetts LLP by contacting Andrew Vey, or Paul Willetts or by visiting the firm’s website. Read more.